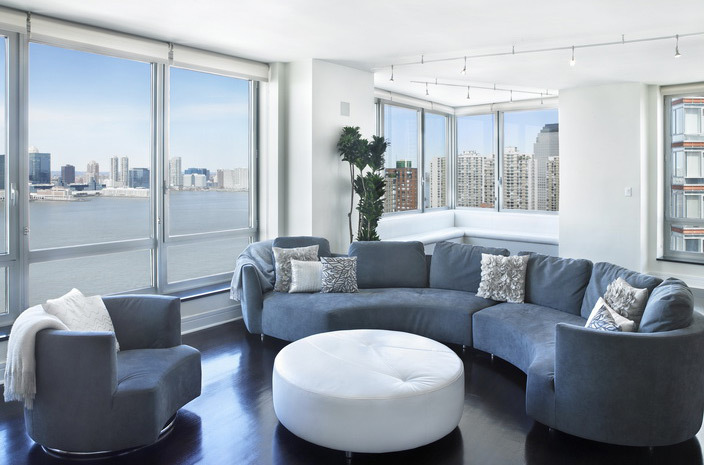 This New York client wanted a sleek, ultra-modern look that was livable and inviting for their newly-acquired Manhattan condominium. 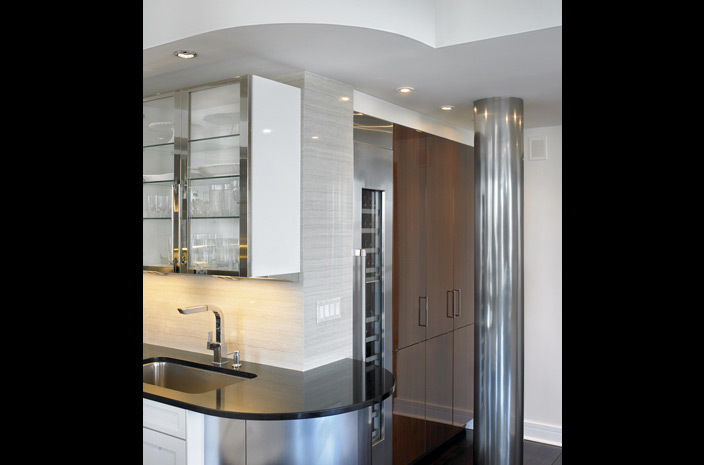 The couple called on LeFevre Wilk Architects, LLC (LWA) to translate their vision from concept to reality. 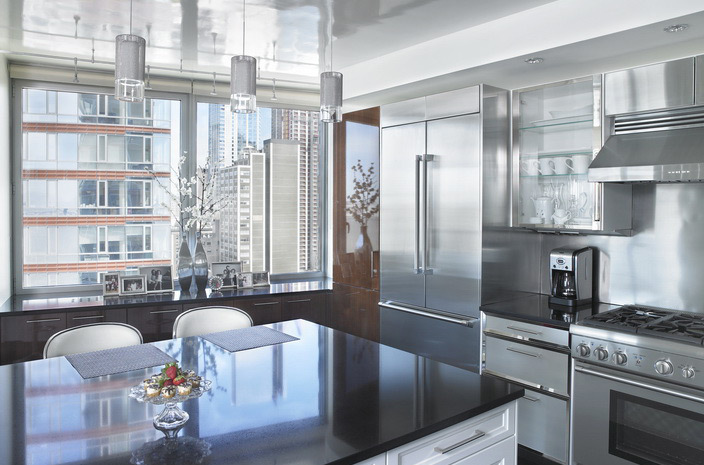 The Manhattan apartment remodel integrated modernistic design elements and a mix of materials to create clean, fluid spaces moving from the entryway and into the kitchen, dining and living rooms. 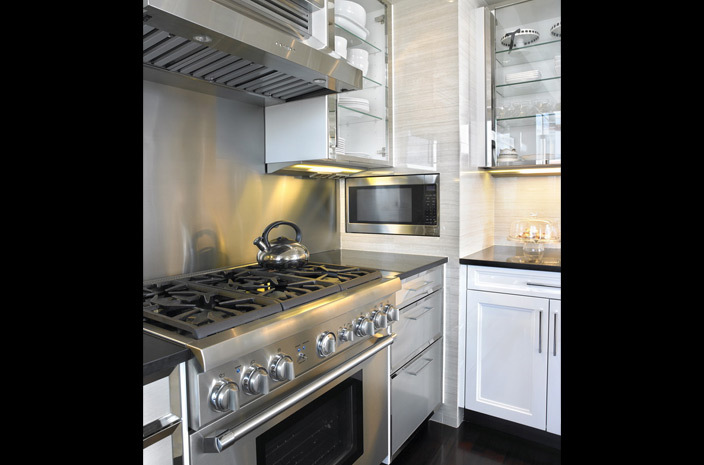 To meet the owner’s desire for contemporary lines in the kitchen, LWA partnered with Spogue Kitchens & Bath of Philadelphia. 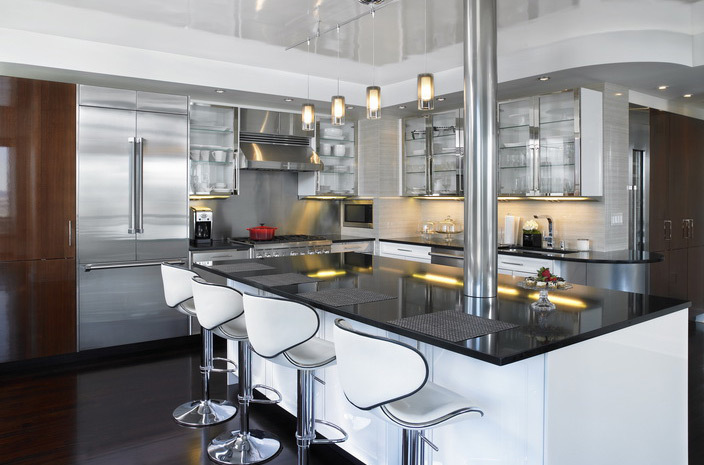 Glass-fronted cabinets mix with jet-black cambria countertops and high-gloss nickel surfaces to project a minimalistic, modern image. 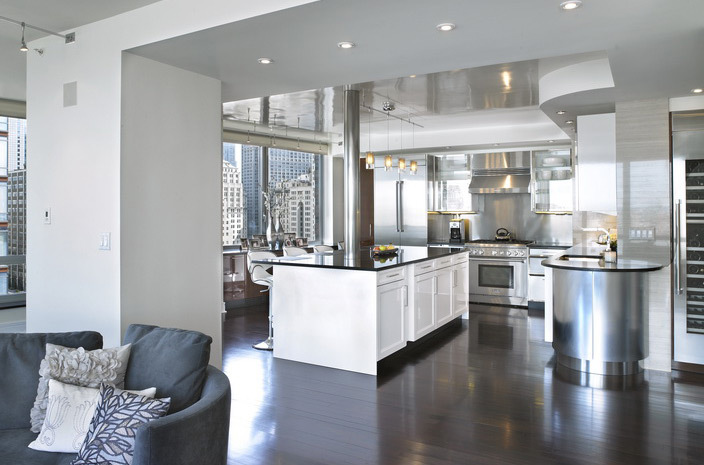 White heirloom-style cabinetry and walnut hardwood floors integrate warmth and functionality into the design. 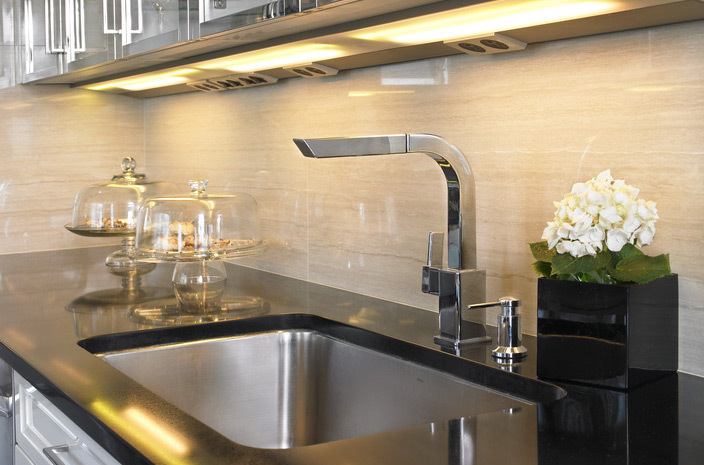 Thanks to LWA’s use of adaptive architecture methodology, the kitchen can be easily adapted if the client’s tastes change. Removal of several walls expanded an already breathtaking view of the Hudson River and the Statue of Liberty, and opened the space to provide a light, expansive feeling. The change is both visually spectacular and elegantly functional. 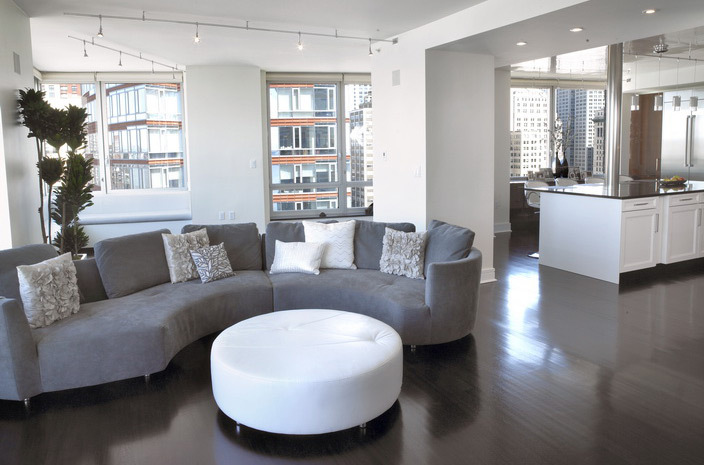 With a restrictive timeline of two months and the family headed out of town for the duration, LWA brainstormed with the homeowners to identify resolutions to all potential issues in order to keep the project on track. To manage challenges presented by making changes to the building’s original design and the resulting limitations, LWA worked closely with the building’s architect, adapting and altering design and product selection. 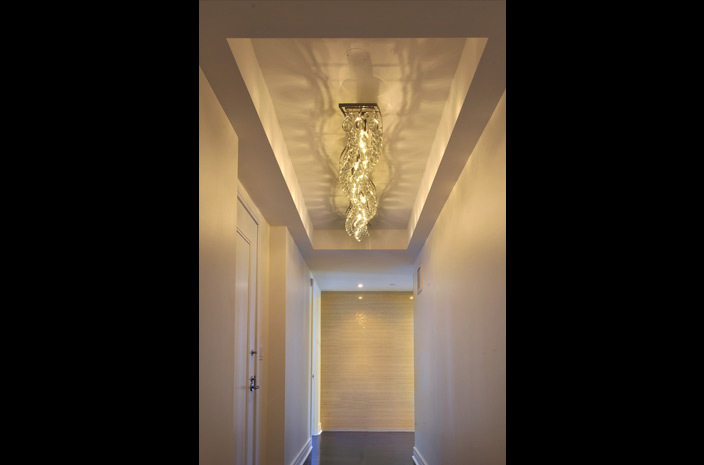 Cement ceilings that couldn’t be drilled prompted creative changes in lighting selections. Pipes that couldn’t be moved became new design elements. 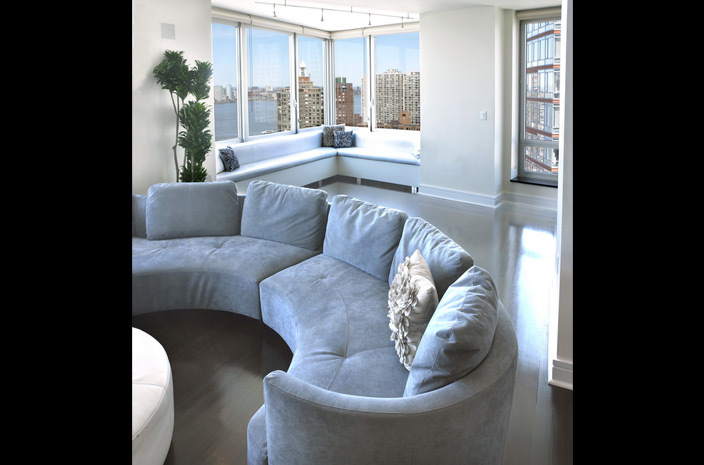 Throughout the apartment, high-gloss ceilings and metal and glass surfaces reflect the natural light, offering a clean, spacious feeling. A natural stone feature wall infuses the living room with warmth and texture, making the whole space restful and comfortable.